Despite the rain and cold weather, Marchand conquered the 10 km climb and reached the summit in less than an hour, and celebrated at the top with a glass of Champagne. He pointed out that it was only 11°C and that he didn’t normally ride unless it was at least 15°C (59°F). 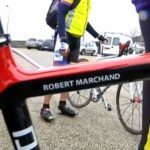 Marchand said: “My doctor tells me I’m doing well and he says to continue what I’m doing – but perhaps to go at it a bit less hard,” after his most recent accomplishment, stating that he wants to continue riding his bike until he is 105. He also added he needs to stay in shape as he will be riding the Ardechoise Sportive (one of Europe’s largest cyclosportive event with around 15,000 riders taking part) this summer, as he has each year since it began in 1992. The evergreen Frenchman previously broke the Hour Record for 100+ age group (twice): on February 17, 2012, he rode 24.25 kilometers (15.1 miles), setting a one-hour speed record in the new over-100s category created by the UCI. Then, on January 31, 2014, he smashed his old Hour Record with 26.927 km (16.73 mi). Marchand also set 100 km (62.14 mi) cycling record for 100+ age group with four hours 17 minutes 27 seconds in September 2012. 103-year-old Robert Marchand cycles in the rain with a small group of riders to celebrate his birthday as he makes his way along the Robert Marchand pass (col Robert Marchand) in France. 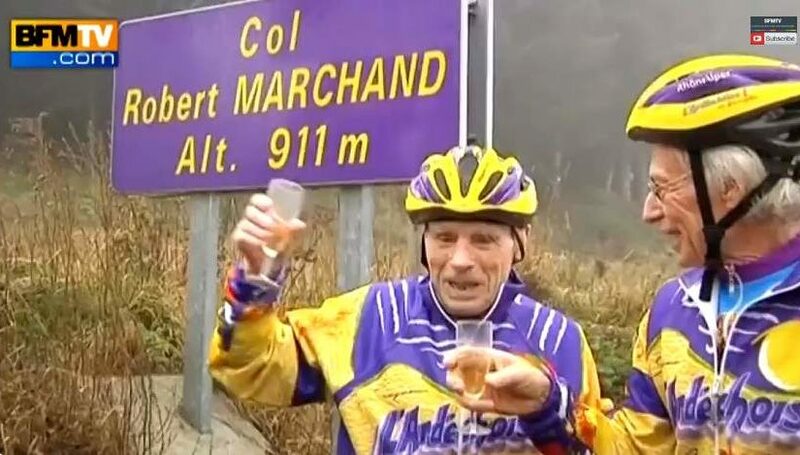 The evergreen Robert Marchand celebrated his 103rd birthday by climbing the col named after him: “Col Robert Marchand“, in the Ardeche mountains, near Saint-Felicien. Altitude: 911-meter (2988 feet). Marchand conquered the 10 km climb and reached the summit in less than an hour, and celebrated at the top with a glass of Champagne.